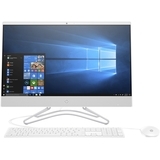 Boost productivity with this HP all-in-one desktop. The 23.8-inch widescreen display delivers a crisp, clear picture at a resolution of 1920 x 1080, and the 1TB hard drive delivers plenty of file storage space. This space-saving HP all-in-one desktop has an Intel Pentium Silver processor and 8GB of DDR4 RAM for smooth multitasking capability. I like the computer. Not as fast as some, but love the screen size, the keyboard and mouse. Loads Visual basic just fine. I would like it to be a little faster to play some more intense games, but, at the same time, it does everything else I need it to. The computer only worked for 24 hrs after setting up. Shut down and could not get it to come back on. I spent hours transferring my data to this computer. It worked beautifully that evening. Next morning when I turned it on, it kept going on and off and best we could figure was it could have been any number of things wrong. To think you buy something and have it break down in one day made me very leary. I took it back. Very disatisfied. I love how sleek this computer is! The large monitor is amazing with vibrant colors. Windows 10 is easy to use and fast. I use satellite Wi-Fi and I am able to connect immediately on signing in. I am very happy with this purchase.